Yulia Kkripal, daughter of former Russian spy. (by Travis Fedschun with AP, FoxNews) – [British police are investigating the attempted murder of former Russian spy Sergei Skripal and his daughter Yulia after both were found unconscious in Salisbury, England on March 4.]. [British Prime Minister Theresa May said on Monday it was “highly likely” that Moscow was responsible for the poisoning in England of a former Russian spy Sergei Skripal and his daughter Yulia. Either the Russian state was directly responsible for the poisoning or it had allowed a nerve agent that was used to poison the former spy and his daughter to get into hands of others, May told Britain’s parliament. The Kremlin has been given a deadline of tomorrow night to respond to the evidence and the government could outline its “detailed” retaliation on Wednesday. Mrs. May said, “This attempted murder using a weapons-grade nerve agent on a British town was not just a crime against the Skripals, it was an indiscriminate and reckless act against the United Kingdom, putting the lives of innocent civilians at risk, she said. “And we will not tolerate such a brazen attempt to murder innocent civilians on our soil.”]. The Kremlin has rejected suggestions it was behind the poisoning, with officials saying Monday they have not heard any official statements of Russian involvement. Skripal and his adult daughter, Yulia, remain in critical condition following the March 4 nerve agent attack in Salisbury. Both were found comatose on a bench near the city center. The 66-year-old Skripal worked for Russian military intelligence before he was recruited to spy for Britain. He was eventually found out and imprisoned by Russia — before being freed in a spy swap in 2010. A police detective who also became ill from the nerve agent was still hospitalized in serious condition Monday, but is reported by British officials to be sitting up and talking. [A week after the attack, Public Health England said there was no immediate health risk to anyone who may have been in either the restaurant or the pub, but their was a small chance that any of the agent that had come into contact with clothing or belongings could still be present in minute amounts and contaminate skin.]. 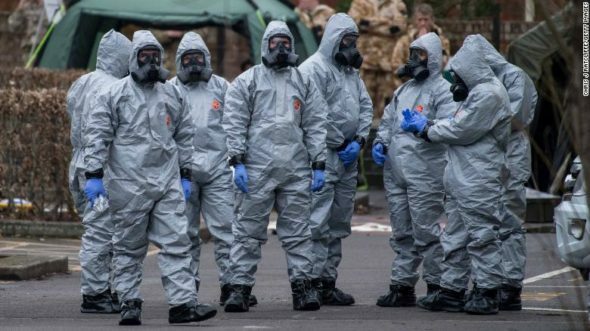 British officials…urged people on Sunday to wash their clothes if they had patronized the restaurant or pub where the Skripals are believed to have been before falling ill. Some officials, analysts and politicians have compared the case to the murder of former Russian spy Alexander Litvinenko, who was poisoned with radioactive tea in London in 2006. A British inquiry at that time concluded the killing had “probably” been authorized by Russian President Vladimir Putin. 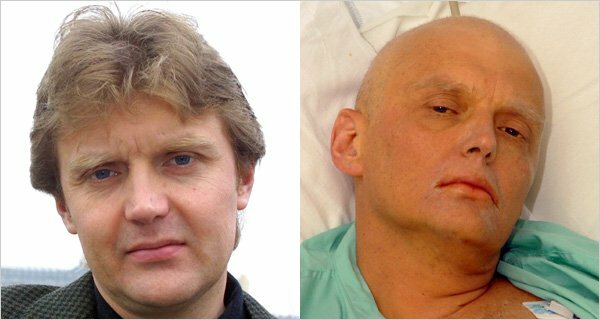 Alexander Litvinenko before and after effects poisoning. He died November 23, 2006.
b) Why has the British prime minister accused Russia of orchestrating the poison attack on the former Russian spy and his daughter? c) How has Russia responded to the accusations? d) Read the “Background” under the questions. What do you think would be the strongest/most effective actions from the British government should the accusations prove true? Explain your answer. How did the Skripals leave such a long trail of contamination? It is staggering, but the statement Sunday (March 11) from health authorities effectively said the pair were in contact with — or carrying — the poison for their entire Sunday (March 4) afternoon trip. Authorities found traces in the Mill pub and the Zizzi pizza restaurant, as well as on the bench where the two began to lose consciousness. This suggests that they perhaps carried the poison with them. But where did they become initially exposed and get their lethal doses? If they, for example, carried an infected package with them for the afternoon and then opened it somewhere, you would expect a larger concentration in one place. Yet health professionals talked about small traces in both the pub and the pizza restaurant. So, they either got their main dose on the bench — say from inhaling a cigarette or opening a package — and immediately succumbed, or were exposed way beforehand. A key question here is how was British Detective Sergeant Nick Bailey given a larger dose than other first responders? He was critically ill, but is now recovering. Does that mean he was heavily exposed at the bench, say from trying to resuscitate the pair? Or, as former police commissioner Ian Blair has suggested, did he go to their home after the bench? Was he looking for medicine for the pair in their house? We don’t know. 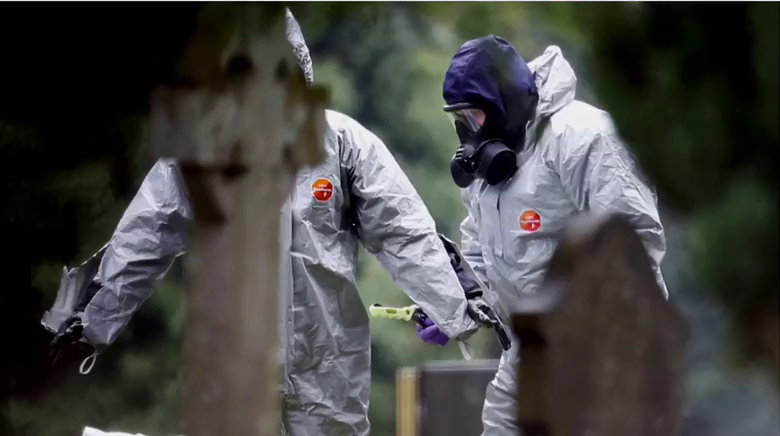 But it looks most likely that the pair were exposed at the start of their afternoon in Salisbury and they carried the contamination with them to all three places. This means the agent took hours to affect them. Why did the presumed would-be assassin choose something so specific and traceable? That is an important question. Presume, for example, that this was ordered at the highest level in the Kremlin — although there’s zero evidence of that. Such a presumption would mean that Vladimir Putin, less than two weeks ahead of an election (that he will undoubtedly win), had ordered a public killing of a dissident that could really only be traced back to Moscow. It would risk more sanctions on Russia’s beleaguered economy and greater isolation: two things that have not played well with [voters]…. So there are two other options. This was done by the Kremlin’s enemies to frame and further confirm Russia as an international bad actor (after Syria and Ukraine, does the West really need further convincing?). Or it was done by a rogue part of the Russian state, set upon further isolating Moscow or seeking to please a Kremlin that wouldn’t be brazen enough to order such an act itself. All three options are, of course, bad news, and suggest Moscow is out of control, with nerve agents being used with a reckless disregard for British public safety. Why are people in Salisbury suddenly being asked to wash all their clothes? The official response from the UK has been puzzling. At first, they thought it might have been an opioid. Forty-eight hours later the counter terrorism police took the lead in the investigation. And then 24 hours after that they stepped forwards to say they knew the “specific nerve agent” it was. Yet, it was only 48 hours after that when the British army was sent in, providing pictures of soldiers in protective suits removing cars and securing gravestones. If there was at no point any risk to public safety — as health officials insisted from the start — these images risked looking like they served a political purpose by making the threat seem severe and the military the required response. And then finally, an entire week later, and four days after the agent has been identified, 500 locals who went to the pub or restaurant are told to wash their clothes and themselves. It’s a baffling chain of events and shows a government that either did not understand what it was dealing with for an entire week, despite insisting there was no threat to public health, or after seven days is amplifying the threat as the political ramifications rear their head. Impose sanctions: Britain already has an extensive range of sanctions against Russia as a result of the invasion of Crimea and eastern Ukraine, but could extend them. The UK could also impose sanctions on named individuals if they are linked to the murder attempt. Britain could pass the ‘Magnitsky List’ mirroring US laws imposing travel bans on senior Kremlin officials responsible for the death of Russian accountant Sergei Magnitsky in a prison in 2009. World Cup boycott: Official representation could be withdrawn from the World Cup in Russia if Kremlin links are proven. There have been calls for the England team to boycott the tournament but their withdrawal would probably have little impact. A coordinated protest, involving the withdrawal of multiple countries, would be far more effective in damaging Vladimir Putin’s showcase international event. However, experts say the nerve agent poisoning is unlikely to create enough international momentum to trigger a wider boycott. Statement of condemnation: Britain may call on the support its closest allies if there is evidence of a Russian murder attempt on UK soil. A joint statement of international condemnation could be issued from leaders including French President Emmanuel Macron and Germany’s Angela Merkel, warning Russia that such actions will not be tolerated.